Some things cannot be explained. They need to be experienced. Like places. I never lusted for travel. Coming, as I do, from a simple middle class professional family of Uttar Pradesh, we used travel as a bonding tool in our growing up years. Simple trips into the Uttrakhand hills and some vacations stay overs at family homes. But, in the last one decade, work took me on an incredible journey around the world. And, I stand today, a changed being. Travel is transformative. Be a tourist or be a traveller, it doesn’t really matter, but get out of your comfort zone. Go explore, see new civilizations, meet new people, eat food different from yours and collect memories. The only way, in today’s explosive world, to save it from annihilation is more people going beyond borders and appreciating what lies on the other side. I want to share with anyone who loves travel, or dreams of it, a handpicked selection from my world travels that have changed my life, and I will recommend them for anyone wanting to change theirs! I am on the fringes of the Arctic. 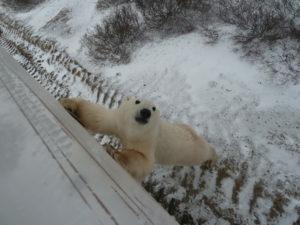 It is snowing outside and there is a polar bear eyeballing me through the window of my bunk bed. Does anything else in this universe even matter? The annual movement of polar bears along the western shore of Hudson Bay in Canada as it freezes over creates one of the greatest wildlife viewing spectacles on earth. 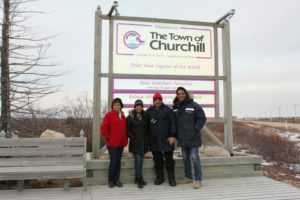 And this travel editor, one November month finds herself time travelling half way across the world taking four flights Delhi –Brussels-Toronto- Winnipeg-Churchill heading to the heart of polar bear country in sub Arctic Canada. Churchill is frozen and desolate and after an Aboriginal dog sledding experience, we are transported to a massive, roomy bus mounted on huge all terrain tires which takes us, after a sludgy, rough ride, to the Tundra Buggy Lodge which is to be our home for next few days and is a caravan-like accommodation parked in the heart of Polar Bear land. It is snowing and freezing cold. And that brings the big guys out. Each sighting of these spectacular animals over the next three days is as thrilling as the first one. This one is a dream trip. It is expensive and takes some preparation. But if you get yourself there, you will turn a star in your eyes and for anyone who matters. The arrival at the Royal Livingston Lodge’s plush splendor on the banks of the Zambezi River, almost right where the Victoria Falls plummet to earth, is dramatic in water taxis landing on the pier with bobbing hippos swimming alongside us the entire way! Dinner at night is under a tree glowing with lanterns as the river laps close by under a deep black star studded sky. The night sky is an extravaganza of stars. With little light pollution and a sparse human population, there are few places on earth where you will experience the many wonders of the night sky with this degree of clarity. Tea at day break is on the huge verandah attached to the suite with a dazzle of zebras galloping right past. 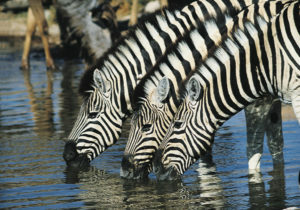 Africa is an absolute must in every traveller’s bucketlist. Take yourself to the mighty Zambezi River, which is more than 2 km wide at this point, plunging noisily down a series of basalt gorges and raising an iridescent mist that can be seen more than 20 km away, in a spectacular show. Take a hike to reach the Devil’s Pool, a natural rock pool at the very edge of Victoria Falls, the point where the waters of the river cascade over. As you stand there wondering if the next gush of water will sweep you over, a herd of elephants will be crossing the river on the horizon even as the sky explodes into molten hues of the most insane sunset you will every witness. I was a bit of cynic when I landed in Canada. Having seen so many images and documentaries on the Niagara Falls, I was sure like most things, reality was going to be a bit of a disappointment. As I tog up in a blue Macintosh and board the boat for the Journey Behind the Falls, I did not realize I am headed for a journey of a lifetime! The awesome spectacle of one-fifth of the world’s fresh water crashing down to the basin below has to be experienced to be believed. During summer daylight hours, over 2,800 cubic meters of water thunders over the brink every second, traveling 65 kilometers per hour! 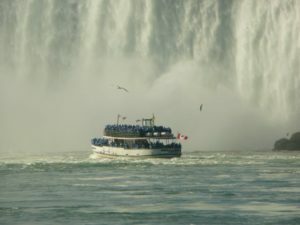 As your boat bobs behind the cascade and you stand awestruck in the mist where the mighty Horseshoe Falls tumbles from 13 storeys above, thank me for suggesting this trip. I am hanging out in an over-water hammock. Reading a book, dipping my toes in the Indian Ocean while a powder white sandbank with a single palm tree stands framed in my view like a painting. It’s almost unreal. But life couldn’t get better. 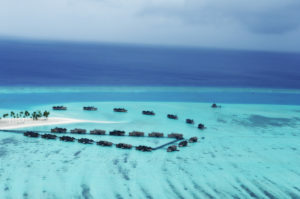 On the equator and deep in the vast Indian Ocean lies a captivating group of over 1,190 coral islands – the Maldives. None of the islands have mountains or rivers, and the islands are merely two meters above sea level, making them the world’s lowest country in elevation. I don’t know whether it is a myth or reality that The Maldives are sinking and may disappear. Global warming is an urgent problem that needs to be remedied immediately. But, till then, The Maldives must find a place a place on your must-do once in life list. Clear, bluest of blue skies, powder white sand, palm trees and water villas. You will be surrounded by so many shades of blue,you didn’t even know they existed! 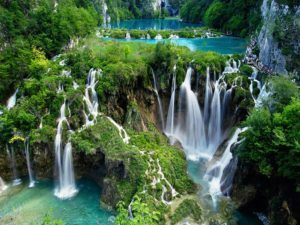 If you want to experience Nature that makes the most obstinate believe in God’s miracles make Plitvice your go to national park. Clouds of butterflies drift above the 18km of wooden footbridges and pathways that snake around the edges and across the rumbling water leading you this UNESCO heritage site. Plitvičkajezera is located in the middle of the country and is about 130 km from the capital, Zagreb. You will return believing in fairytales. 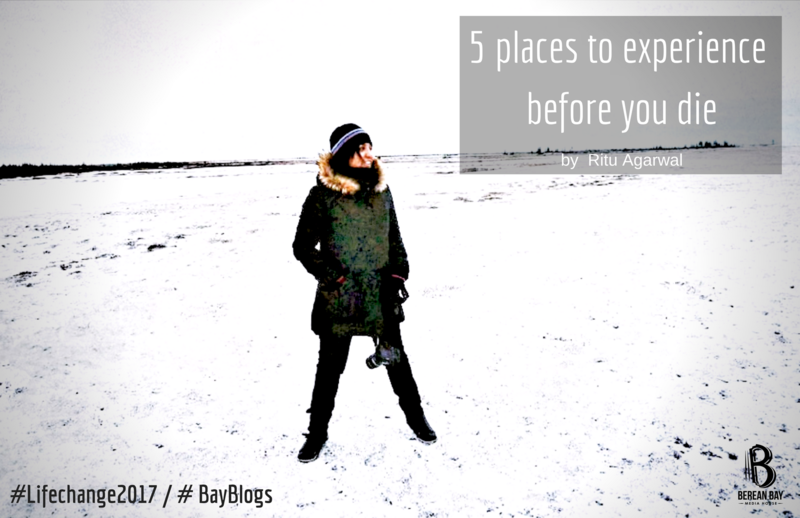 These are my top five picks for international travel. How about you? Are there any places you would like to visit? 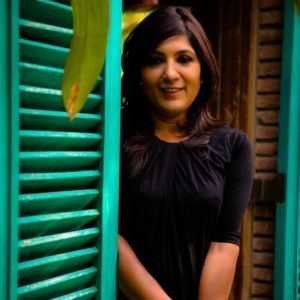 I have done two of those mentioned by Ritu Agarwal. Travel does affect you in a positive way. Between wealth and experience, I will always choose experience!